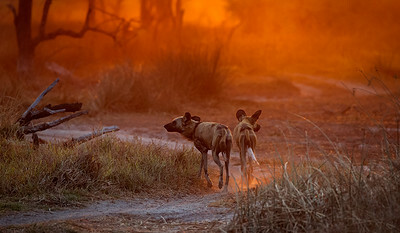 March 2016 - Cathleen Burnham and I organized a Wild dog safari last September, spending ten days at a private tented camp in the Okavango Delta, Botswana. 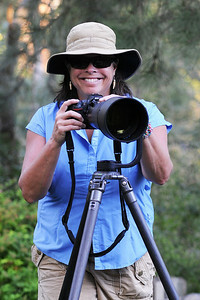 We were very successful finding, hunting and photographing a small pack of seven. November, 2015 - I was photographing a breeding herd of Cape buffalo which is always a challenge. These dark animals soak up the light, are often mud encrusted and rather cranky. It has been very tough for me to get any kind of shot of them that has pleased me despite many years of trying. This time I became fascinated with the active Yellow-billed Oxpeckers flying on and around all the Buffalo and wondered what I might be able to make of all this activity. The challenge began to capture an Oxpecker in focus as it came in for a landing. The Yellow-billed Oxpecker is native to Africa and will perch on Cape buffalo as well as other mammals to eat the ticks and other parasites found on the animal. I found light was key in capturing this image. The result of my efforts is on the right. 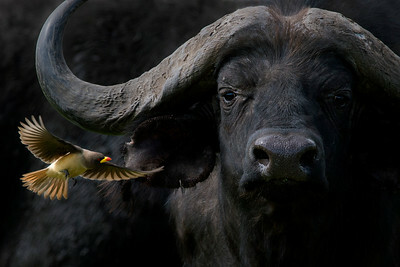 I was able to capture a dramatic and colorful illuminated Oxpecker with the darker Cape Buffalo filling the background. This image won first place in Share the View International Photo Competition, 2015; Honorable Mention, International Photographer of the Year, 2015; and Best of Show in the Wildlife Experience Photo Competition, 2016. April, 2014 - We were heading out from the lodge early in the morning when our Driver suddenly stopped the vehicle. He heard the alarm call of the Francolin, a ground dwelling bird and knew that meant that one of the big cats: leopard, cheetah or lion, was close. But which would it be and could we spot them? Since it was prime country for leopard, we were hoping that might be what had the bird in such a fuss. Just then, out of the bush walked two very beautiful leopards! It was a lovely female with her almost grown cub. They were on the hunt that morning and were quickly and quietly moving through the acacia forest. Both cats were not stressed one bit and paid our vehicle no mind. It was so amazing to observe their behavior. But it was also challenging photographically, trying to capture the pair with my camera as they moved in and out of the deep shade, into the early light. 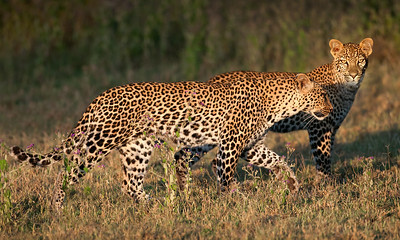 I found the key for me was to wait and capture the leopards when they were just emerging from the shadows, or in the case of the image on the right, moving past a darker background which then showed the brilliant colors of their coats lit by the early rays of the sun. We stayed with them for over two hours watching, learning, marveling at our luck. I collapsed in a happy but exhausted heap next to my Driver, having spent every ounce of energy and focus on these two. This was one of my most exhilarating and memorable experiences. April 2013 - I was in the Serengeti shortly after the rains and found it just as thrilling and magical as if it were my first time. However, cloudy skies and the overgrown bush from those recent rains made it difficult to see lion cubs. I knew they were about but could not spot any. Lions and more specifically their cubs are for me the most cherished part of each safari and so I was getting a bit frustrated and disappointed. Where were those little fluff balls? I was really not expecting much in the way of lion encounters as we headed North for the last part of our safari, the Maasai Villages are rather close to the park boarders there. Maasai will kill lions if they think their livestock become endangered so sightings are less common. But as so often happens, it all changed in just a moment! As we crested a hill and began making our way down, lush green grasses covered the landscape as far as the eye could see. In the midst but miraculously near the road, we spotted three healthy female lions lying atop an overgrown termite mound. 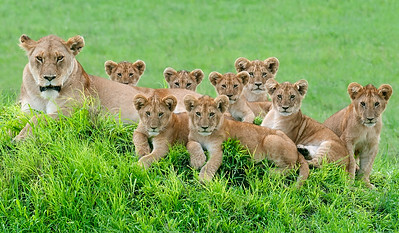 As we approached and stopped to photograph, eight tiny cubs emerged slowly one after the other from a nearby thicket. They must have been napping when they heard the approach of our vehicle. One by one they trundled up the hill and lay down next to one of the females. And...as if by some magic trick, the clouds opened up and for a second just when all cubs looked toward us, the light was perfect. I got the image on the right and such happy memories. Never again will I have that moment, but it was enough. And it taught me once again that the unexpected can happen and that patience can be rewarded. Africa never stops astounding me.